For Many People Who Are Bed Ridden Specially The Older Generation And For Those Who Have Had Colon Cancer One Issue Is A Constant And That Is A Loss Of Bladder Control. This Can Be Embarrassing When It Occurs And Frankly Annoying. By The Way Bladder Loss Control Is Not Something That Only Affects The Older Generation But Also Many Young People Have This Issue Also. We At Kleinert’s Understand This And That Is Why We Developed And Sell Our Duralite Waterproof Incontinence Pant To Help With Bladder Loss Control. It’s Soft And Noiseless And Does Not Create Heat Unlike Other Plastic Or Vinyl Waterproof Incontinence Pants Which Is Very Important. Its Smooth Nylon Fabric Is Very Soft To The Touch. If You Are Allergic To Plastic, Rubber Or Vinyl Pants Do Not Fret As Our Duralite Pant Is Not Made Of These Materials And You Will Feel Much More Comfortable. Better Skin Care Occurs Because Of Less Irritation And No Breakdown Of Skin Integrity Which Can Cause Decubitus Ulcers & Pain Which Is Very Common To Bed Ridden Patients Especially Those In Nursing Homes. Designed For All-Day & Over-Night Comfort. 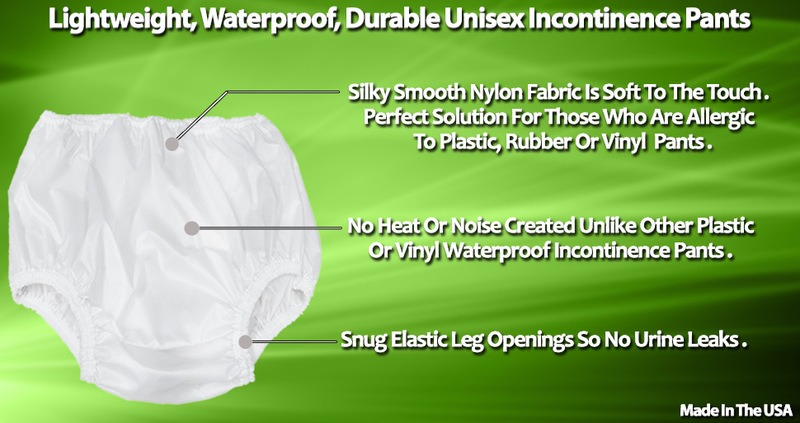 THE WATERPROOF INCONTINENCE PANT Is Meant To Be Worn Over Any Adult Diaper, Adult Disposable Briefs Or Adult Protective Underwear And Not Alone. Made For Men And Women, These Pants Are A Wonderful Alternative To Old Fashioned Plastic Pants And Work Great When Used As A Diaper Cover, Whether Disposable Or Reusable. Duralite Nylon Fabric Is A Soft, Light-Weight, Waterproof And Stain-Proof Material That Lasts Hundreds Of Washings Unlike Plastic Or Vinyl Pants Which Can Crack. The Duralite Pant Is Very Quiet Also. It Is Important To Measure The Circumference Around Your Thighs Because It Is Critical That The Elastic Be Snug In This Area So That No Urine Can Leak Down. Please Do This Before Purchasing. As Long As This Is Adhered To You Will Not Suffer Leakage. You Can Sleep With The Duralite Pant On All Night And Stay Dry As It Will Hold Fluid In Place. Duralite Pants Provide Excellent Resistance To Mildew, Mold, Fungus & Bacteria. The Duralite Waterproof Incontinence Pant Is Environmentally Friendly Due To Chemical Free Process Of The Fabric Used. The Quality Of This Product Will Amaze You, As It Will Outlast Any Latex, Rubber Or Plastic Pants. We Have Many 5 Start Reviews From Our Customers Who Love This Product. It Has Really Helped Them In Their Unique Situations With Bladder Loss. In Fact Some Customers Have Reported The Following To Us If Any Urine Odor Is Present After Use. They Discovered That By Adding 1/4 - 1/2 Cup Of White Vinegar Along With Detergent, They Were Able To Remove The Urine Odor. Sometimes With A Second Rinse, And They Are Free Of The Vinegar Smell As Well. We Thank Our Customers For These Tips And Several Washings Later The Pants Still Work Great. Please See Diagram Below For More Info. Our Product is NOT INTENDED TO BE USED AS SWIMWEAR & ONLY FOR ADULTS NOT CHILDREN. Why Do We Sweat More In The Summer? Copyright 2013. Simple theme. Theme images by luoman. Powered by Blogger.